(TibetanReview.net, Jan31, 2015) – Tibet’s exiled spiritual leader, the Dalai Lama, and US President Barack Obama may make their first joint appearance at a public event next week, reported time.com Jan 29. The Tibetan leader will participate in the Feb 5 National Prayer Breakfast which President Obama has not missed since taking office, noted dailymail.co.uk Jan 29. To allay concern that this may invite criticism from China and raise doubts about the likelihood of Obama attending the event, the organizers have said the Dalai Lama will not have a speaking role. “The Dalai Lama will be at the breakfast, but he does not have a speaking role,” the report quoted Alex Miller, press aide for Pennsylvania Senator Bob Casey, who is co-chair of the event, as saying. The other co-chair is Senator Roger Wicker (R., Miss.). 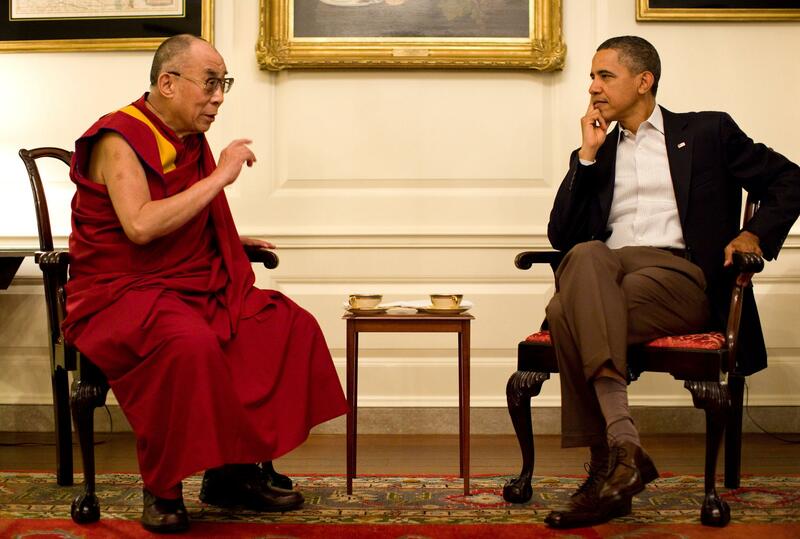 President Obama has previously met with the Dalai Lama three times, but always without the press and outside the Oval Office in deference to Chinese objections. The National Prayer Breakfast is an annual, historically Christian event at the Washington Hilton for hundreds of mostly evangelical and other faith leaders. The President of the United States and First Lady have long attended, and the President traditionally speaks, the report noted. The last time Obama met with the Dalai Lama was in 2014. At that time Chinese Vice Foreign Minister Zhang Yesui summoned a US diplomat to register his nation’s objections in order to drive home the point that it amounted to interfering in China’s internal affairs and would affect bilateral relations to the detriment of US interests. The theme of the National Prayer Breakfast will be “Remembering the Armenian Genocide of 1915″ and it will be aired Feb 5 on C-SPAN. “I’m sure that more than a few Chinese officials will be carefully watching to see how close the President and Dalai Lama come to one another and if any words are exchanged,” noted a blog posting on patheos.com Jan 29.